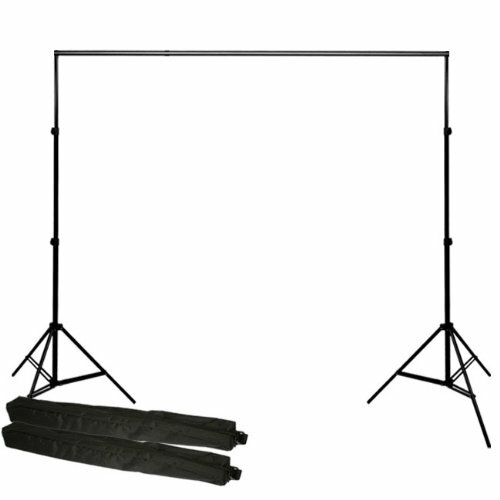 This is a very strong backdrop support system with a 2 section telescopic cross bar that extends from 6ft to 12ft. The stands have all metal locking collars, rubber tips on legs to prevent movement, smooth and easy lowering and raising, holds canvas, paper or muslin up to 15lbs. Stands come with 5/8,1/4, 20 adapter they can be used as light stands.The 2 section cross bar extends from 6ft to 12ft, no more wing nuts to lose. This support systems compacts down to 47in. This all metal system will give you years of service.